Home » Blog » My Garage Door is Stuck! What Should I Try First? My Garage Door is Stuck! What Should I Try First? Believe it or not, this could be the culprit. Because of the long battery life, it is often the first thing overlooked when the garage door stops working. If all is well with the remote, pull the cord hanging from the main box on the ceiling. This should allow you to manually open the door. Check the breaker to the garage door, and also check to make sure the main unit is still plugged in. Check to make sure there are no obstructions in the track. It may be something very simple as a shovel, broom, or toy stuck in the track preventing the door from opening or closing. Removing the item should get the door back on track. Check to see if the door was locked by mistake. This is an easy fix that often goes overlooked as well. Check to see if there is a gap between your springs. This will indicate whether or not they are broken. If a piece of the spring is hanging on the side of the garage door, this may be the reason the door is not working. Call a professional to get this checked and repaired. There are times when the door may roll off track. You will be able to see whether or not the rollers are out. If the panels are okay, the door will not need to be replaced. If the panels are damaged, a professional will have to come and correct the issue, which may require you getting a new door. If you live in a cold climate, the weather may play a role in your garage door sticking. The door may be frozen and sticking to the ground, which is prohibiting it from working properly. If this is the case, pour warm water along the bottom of the door to allow the ice to melt and the door should work again. These are just common instances of why a garage door may not work, and simple resolutions that will help you get the door back on track unless the problem is more serious and requires the assistance of a professional. 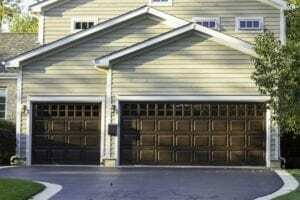 Action Garage Door Repair Specialists can help determine any issues and get your door working properly in no time. For more information, contact a team member today!